Cigar smoking is a wonderful pastime akin to enjoying a fine wine or a gourmet meal. If you are a beginner and want to explore, getting started can seem daunting. Many of us don't want to seem ignorant and are afraid to ask questions which make us seem unqualified to enter this "secret world" which was once seen to be the reserve of aristocracy and villains in Hollywood movies. Well, I say, no more. In an age where information is at our fingertips 24/7, we can read until our eyes bleed about the technical etiquette of cigars and scroll through millions of carefully curated Instagram posts of "Edicion Limitada" Cuban cigars and Grand Reservas, but the only way to really learn and enjoy cigars is to sample a wide range. We might be tempted to think, "I should start with 'the best' and I remember my friend said Cohiba, so I'll get that". While, yes, a Cohiba is a very exquisite cigar, its also a very full bodied cigar and this may not be where you want to start on your journey. The size of the cigar you choose also has a great impact on your experience. 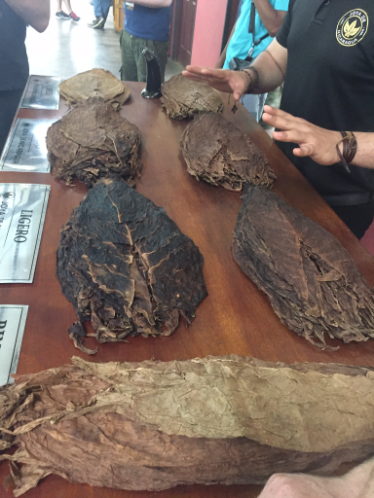 The blend of tobaccos used in a cigar, of which there are numerous, will determine the flavours and strength alongside the size of the cigar also impacting the strength (the fatter the cigar, generally the less intense it will be because the smoke is less concentrated on the palate and it burns a little less quickly than a thinner cigar). I learnt this lesson in the Dominican Republic whilst visiting La Flor Dominicana's tobacco fields. I was feeling the effects of the red wine from the night before and decided I wanted to try a cigar called "La Volcada" which is very powerful and full-bodied. It is a delicious cigar and I have managed to enjoy one at a more appropriate hour but at 11am, it really did knock me to the floor! With The Cigar Sampler subscription box, we are trying to curate a selection that will give you a rounded experience, each month, with cigars from different countries, different sizes and different flavour profiles. Hopefully, you'll find new flavours you love and want to explore. This was me having to sit down with La Volcada! Whether you are a complete beginner of cigar smoking, you have a piqued interest or even an aficionado, here are a few interesting facts about cigars. The thickness, or Ring Guage, of a cigar is measured in 64ths of an inch. So a cigar with a Ring Guage of 64 is 1 inch in diameter. A dark wrapper doesn't necessarily mean a strong cigar. 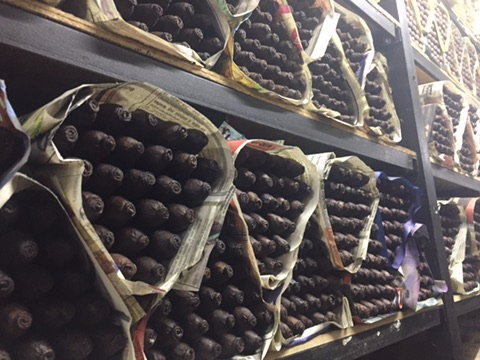 The dark maduro wrapper comes from the top leaves of the plant which are thicker and greener and take much longer to age and ripen. This lengthier processes often results in a sweeter flavour profile. 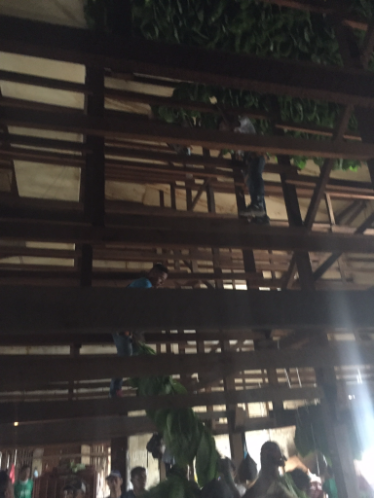 The lighter leaves are leaves found at the bottom of the plant, which are older and thinner than the top leaves, and so after curing and fermentation, the produce a lighter colour than the maduros. Because there is less sugar found in these lighter, Claro, leaves, there is a certain dryness to the cigars taste. Some may say that the flavour of the Maduro wrapper goes better with more rich, full flavoured filler leaves, hence the presumption that the darker wrapper is always a full flavoured cigar. The lighter wrapper goes better with more delicate fillers which, again, are lighter. The coolness of your cigar has to do with the ring guage. The fatter the cigar, the more air flows through as you smoke, thus a cooler cigar. Do not keep your cigars in the fridge. This misconception will cause them to dry out rather than keep them in humid and fresh! Cigars with an oily sheen show that the stogie has been kept at humidity. Don't use a petrol lighter to light your cigar. The chemical taste will pass through to your smoke. Don't touch the cigar to the flame when lighting. Hold the cigar a tiny bit above the flame and gently puff the cigar to heat and light. Cuban cigars hold so much prestige, and don't get me wrong, are amazing cigars, but there are also incredible, great value cigars from Nicaragua, Dominican Republic, Honduras etc. We live in the U.K. and have such a heavy tax on tobacco so cigars aren't cheap! Cigars from these countries offer so much value for money without a humongous price tag. Cigar smoking is a joyful experience and finding the perfect cigar for you is about experimenting and finding what suits your palate. So go fourth and have fun! So with the smoking legislations which have been passed and come fully into effect by May 2017, which will see a ban in flavoured cigarettes and tobacco (including menthols!) amongst other things such as plain packaging and larger quantities (30g tobacco and 20 cigarettes) being the minimum. We have sold lots of packs of flavoured cigarettes in the past including Black Devils, Ziganov Cherry and Vanilla, the Djarum Kretek cigarettes and Tor Oriental and Turkish showing there is a definite market and demand for them. We also have sold countless quantities of flavoured rolling tobacco which we weigh out. These, my friends, are imminently a thing of the past. However, lo and behold, introducing Frizc flavour cards! I saw them at a trade show recently and thought they were so clever. They come in various flavours and you insert the flavoured card into your cigarette packet and leave for at least an hour. Then voila, your cigarettes will all be flavoured! The cards are food grade and essentially you can flavour anything you choose, including vodka! One card is £1 so not bank breaking. For those who like to roll your own flavoured cigarettes, we will be selling the tobacco flavouring by itself so you can spray any brand of tobacco you choose. Each bottle is £9.99 and lasts a long time as you don't need that much spray for a decent flavour. Any questions or comments, don't hesitate to ask!